paleric: THE MAN NGINGE' : ¿ESPAÑOL? THE MAN NGINGE' : ¿ESPAÑOL? Recently, I noticed a good number of comments on Chamorro culture social media sites stating that the man nginge' is a Spanish custom. None of the people claiming this provide any historical evidence. How can they? It isn't there. García says, "They (the Chamorros) practice many courtesies, and an ordinary usage on meeting and passing in front of one another is to say 'ati arinmo,' which means 'Allow me to kiss your feet.'" He also says, "To pass the hand over the breast of the person they visit is a great courtesy." So we notice here no mention of taking someone's hand and "kissing" it with the nose, which is how we have practiced the man nginge' for at least a couple of hundred years, if not longer. Bishops and the higher clergy wore rings and it was that which people kissed. The rings were symbolic of the church dignitary's spiritual marriage to his diocese. In certain situations, political or military leaders had their rings, or hands, kissed with the lips as a sign of loyalty by subordinates. By "close" I mean we have common racial and linguistic roots and many similar customs and values. 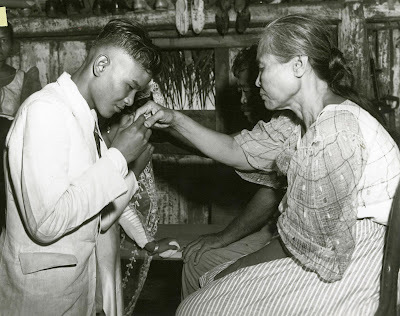 Like the Filipinos, Malays and Indonesians take the hand to the forehead, but, according to some writers, the hand is sometimes "kissed" with the nose, but never with the lips, the same way Chamorros avoid using the lips. Perhaps some people think the gesture is Spanish-based because the gesture is accompanied by Spanish loan words. When one reverences the hand of a man, one says, "Ñot," which is short for Spanish "señor," or "sir." For a woman, "Ñora," short for "señora" or "madam." The Filipinos also borrowed the Spanish word mano, or "hand," and call their form of hand-reverencing the mano po. That phrase is a combination of Spanish mano and Tagalog po, a term of respect. 2. The roots of the man nginge' lie in our pre-contact indigenous culture because early accounts do speak of other gestures of respect, so at least the roots and the cultural values were already in place before colonization. 4. It is possible that our ancestors did reverence the hand, even though European writers did not document it. After all, García says the Chamorros of the 1600s practiced "many" courtesies, although he details only three of them. 5. It is possible that, in pre-contact society, reverencing the feet was reserved for special situations and that reverencing the hand was the norm, although the verbal formula "Allow me to kiss your feet" remained. This is similar to the old custom of ending a letter in Spanish with "I kiss your hand" even though that was not meant literally. Other than that, I think we are on shakier ground drawing other conclusions. Many of my own conclusions are couched in words like "perhaps" or "possibly" because coincidences and similarities alone are not sufficient to prove connections. I too believe that man nginge' is not of Spanish origin. It's interesting to note that the Maori practice hongi where two people press their noses against each other, exchanging their ha or breath of life. Hawaiians call this honi. It's loosely translated as a kiss, perhaps because of western influence. But the Hawaiians too see it more as exchanging ha, also pressing their noses together and breathing. Neither the Maori nor the Hawaiians were ruled by Spain. It's also interesting that the last syllable in hongi is similar to the last syllable in nginge'. I vote for an Austronesian origin. Thanks for always providing insightful, fascinating and wonderful knowledge of our culture. Having seen the Malay custom of placing the hand of the respected person on one's forehead numerous time in Singapore and Malaysia, it would seem that this is a common Malayo-Filipino custom. There are some linquistic anecdotes about how some words seem closer to Malay than Tagalog. I always enjoyed katupat with the Malay bbq though I no longer see katupat on Guam. And the leaders of the Malays have the honorific "Tun" as in Tun Abdul Rahman, one of their early 20th century leaders. Tun is still in use on Guam to show respect for the elderly but I do miss katupat.